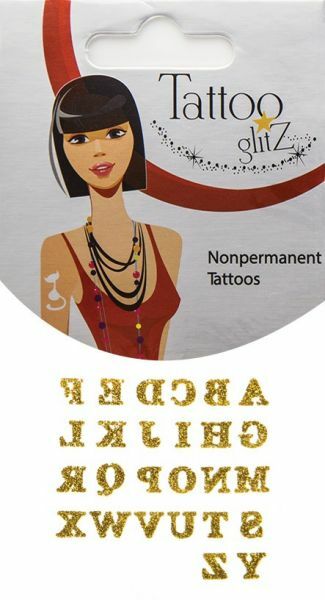 Tattoo GlitzAlphabets Glitter Tattoo Gold ColorApplication Instructions:1. Skin should be clean, dry and free of oils and makeup. 2. Remove the transparent layer. down and make sure to wet it thoroughly with warm water. 1. Skin should be clean, dry and free of oils and makeup. 5. Wait 30 seconds then peel o_ the back layer carefully. or the sticky side of adhesive tape.